Did you know you can put your ceiling fan to work year-round? Simply by reversing the direction and changing the speed, the same fan that cools you in summer can keep you warmer in winter as well! 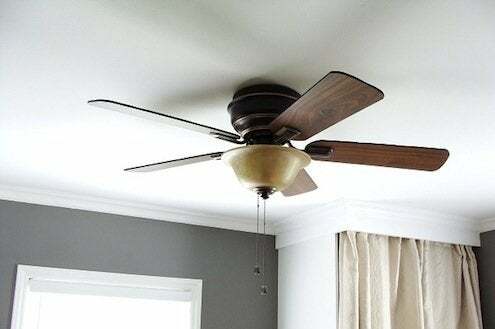 In the summer, a ceiling fan rotating in a counterclockwise direction on medium or high speed creates a cooling effect by pushing the air down into the room and past you quickly. It can’t change the temperature of the room, it’s simply there to kick up a breeze. Changing the direction of your fan during heating season will cause the blades to pull air up out of the center of the room, displace the heated air collecting near the ceiling, and push it back down the walls to where you can appreciate it. Low speed is all you need to keep this effect working for you in winter. To reverse the direction of your ceiling fan, first switch the fan off and wait for it to stop completely. Look for the small toggle switch on the side of the motor casing and switch its position. When you turn the fan back on, it’ll rotate the other way.